Ballroom dance may refer, at its widest definition, to almost any type of partner dancing as recreation. However, with the emergence of dancesport in modern times, the term has become narrower in scope, and traditionally refers to the five International Standard and five International Latin style dances (see dance categories below). The two styles, while differing in technique, rhythm and costumes, exemplify core elements of ballroom dancing such as control and cohesiveness. Developed in England, the two styles are now regulated by the World Dance Council (WDC) and the world dancesport federation (WDSF). In the United States, two additional variations are popular: American Smooth and American Rhythm, which combine elements of both traditional Latin and Ballroom dances. The term 'ballroom dancing' is derived from the word ball which in turn originates from the Latin word ballare which means 'to dance' (a ball-room being a large room specially designed for such dances). In times past, ballroom dancing was social dancing for the privileged, leaving folk dancing for the lower classes. These boundaries have since become blurred, and it should be noted even in times long gone, many ballroom dances were really elevated folk dances. The definition of ballroom dance also depends on the era: balls have featured popular dances of the day such as the Minuet, Quadrille, Polonaise, Polka, Mazurka, and others, which are now considered to be historical dances. 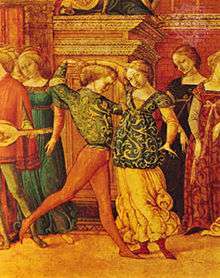 The first authoritative knowledge of the earliest ballroom dances was recorded toward the end of the 16th century, when Jehan Tabourot, under the pen name "Thoinot-Arbeau", published in 1588 his Orchésographie, a study of late 16th-century French renaissance social dance. Among the dances described were the solemn basse danse, the livelier branle, pavane, and the galliarde which Shakespeare called the "cinq pace" as it was made of five steps. In 1650 the Minuet, originally a peasant dance of Poitou, was introduced into Paris and set to music by Jean-Baptiste Lully and danced by the King Louis XIV in public, and would continue to dominate ballroom from that time until the close of the 18th century. Toward the latter half of the 17th century, Louis XIV founded his 'Académie Royale de Musique et de Danse', where specific rules for the execution of every dance and the "five positions" of the feet were formulated for the first time by members of the Académie. Eventually, the first definite cleavage between ballet and ballroom came when professional dancers appeared in the ballets, and the ballets left the Court and went to the stage. Ballet technique such as the turned out positions of the feet, however, lingered for over two centuries and past the end of the Victoria era. The waltz with its modern hold took root in England in about 1812; in 1819 Carl Maria von Weber wrote Invitation to the Dance, which marked the adoption of the waltz form into the sphere of absolute music. The dance was initially met with tremendous opposition due to the semblance of impropriety associated with the closed hold, though the stance gradually softened. In the 1840s several new dances made their appearance in the ballroom, including the Polka, Mazurka, and the Schottische. In the meantime a strong tendency emerged to drop all 'decorative' steps such as entrechats and ronds de jambes that had found a place in the Quadrilles and other dances. Modern ballroom dance has its roots early in the 20th century, when several different things happened more or less at the same time. The first was a movement away from the sequence dances towards dances where the couples moved independently. This had been pre-figured by the waltz, which had already made this transition. The second was a wave of popular music, such as jazz, much of which was based on the ideas of black musicians in the USA. Since dance is to a large extent tied to music, this led to a burst of newly invented dances. There were many dance crazes in the period 1910–1930. The third event was a concerted effort to transform some of the dance crazes into dances which could be taught to a wider dance public in the US and Europe. Here Vernon and Irene Castle were important, and so was a generation of English dancers in the 1920s, including Josephine Bradley and Victor Silvester. These professionals analysed, codified, published and taught a number of standard dances. It was essential, if popular dance was to flourish, for dancers to have some basic movements they could confidently perform with any partner they might meet. Here the huge Arthur Murray organisation in America, and the dance societies in England, such as the Imperial Society of Teachers of Dancing, were highly influential. Finally, much of this happened during and after a period of World War, and the effect of such a conflict in dissolving older social customs was considerable. Later, in the 1930s, the on-screen dance pairing of Fred Astaire and Ginger Rogers influenced all forms of dance in the USA and elsewhere. Although both actors had separate careers, their filmed dance sequences together, which included portrayals of the Castles, have reached iconic status. 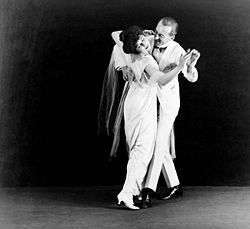 Much of Astaire and Rogers' work portrayed social dancing, although the performances were highly choreographed (often by Astaire or Hermes Pan), and meticulously staged and rehearsed. Young couple dancing cha-cha-cha at a junior Latin dance competition in the Czech Republic. Competitions, sometimes referred to as Dancesport, range from world championships, regulated by the World Dance Council (WDC), to less advanced dancers at various proficiency levels. Most competitions are divided into professional and amateur, though in the USA pro-am competitions typically accompany professional competitions. The International Olympic Committee now recognizes competitive ballroom dance. It has recognized another body, the World DanceSport Federation (WDSF), as the sole representative body for dancesport in the Olympic Games. However, it seems doubtful that dance will be included in the Olympic Games, especially in light of efforts to reduce the number of participating sports. Ballroom dance competitions are regulated by each country in its own way. There are about 30 countries which compete regularly in international competitions. There are another 20 or so countries which have membership of the WDC and/or the WDSF, but whose dancers rarely appear in international competitions. In Britain there is the British Dance Council, which grants national and regional championship titles, such as the British Ballroom Championships, the British Sequence Championships and the United Kingdom Championships. In the United States, amateur dance proficiency levels are defined by USA Dance (formerly United States Amateur Ballroom Dance Association, USABDA). Ballroom dancing competitions in the former USSR also included the Soviet Ballroom dances, or Soviet Programme. Australian New Vogue is danced both competitively and socially. In competition there are 15 recognised New Vogue dances, which are performed by the competitors in sequence. These dance forms are not recognised internationally, neither are the US variations such as American Smooth, and Rhythm. Such variations in dance and competition methods are attempts to meets perceived needs in the local market-place. Internationally, the Blackpool Dance Festival, hosted annually at Blackpool, England, is considered the most prestigious event a dancesport competitor can attend. Formation dance is another style of competitive dance recognised by the IDSF. In this style, multiple dancers (usually in couples and typically up to 16 dancers at one time) compete on the same team, moving in and out of various formations while dancing. Intermediate level international style Latin dancing at the 2006 MIT ballroom dance competition. A judge stands in the foreground. In competition ballroom, dancers are judged by diverse criteria such as poise, the hold or frame, posture, musicality and expression, timing, body alignment and shape, floor craft, foot and leg action, and presentation. Judging in a performance-oriented sport is inevitably subjective in nature, and controversy and complaints by competitors over judging placements are not uncommon. The scorekeepers—called scrutineers—will tally the total number recalls accumulated by each couple through each round until the finals, when the Skating system is used to place each couple by ordinals, typically 1–6, though the number of couples in the final may vary. Sometimes, up to 7 couples may be present on the floor during the finals. ≤≠″°—and bronze the lowest. In these levels, moves are restricted to those written in syllabus, and illegal moves can lead to disqualification. Each level, bronze, silver, and gold, has different moves on their syllabus, increasing in difficulty. At these levels, the elaborate costumes are not allowed, as there are very strict clothing restrictions. Jewels on costumes or hair can lead to disqualification. Open levels are reserved for higher-skilled dancers, usually taking time to get to that caliber of dancing. There are three levels in the open category; novice, pre-champ, and champ in increasing order of skill. At those levels, dancers no longer have restrictions on clothing, so gowns covered in jewels for example, are allowed in the smooth and standard dances, and fringe dresses with huge cutouts and elaborate designs are now allowed in the rhythm and Latin categories. Women also tend to wear extremely intricate hairstyles and bright makeup, often with jewels glued on in patterns. Medal examinations for amateurs enable dancers' individual abilities to be recognized according to conventional standards. In medal exams, which are run by bodies such as the Imperial Society of Teachers of Dancing (ISTD) and the United Kingdom Alliance (UKA), each dancer performs two or more dances in a certain genre in front of a judge. Genres such as Modern Ballroom or Latin are the most popular. Societies such as the ISTD and UKA also offer medal tests on other dance styles (such as Country & Western, Rock 'n Roll or Tap). In some North American examinations, levels include Newcomer, Bronze, Silver, Gold, Novice, Pre-championship, and Championship; each level may be further subdivided into either two or four separate sections. There is a part of the ballroom world dedicated to college students. These chapters are typically clubs or teams that have an interest in ballroom dancing. Teams hold fundraisers, social events, and ballroom dance lessons. Ballroom dance team’s goals are to have fun and learn to dance well. There is a strong focus on finding a compatible dance partner and bonding with teammates. There is also a competitive side to collegiate ballroom. In competitive collegiate ballroom, competitors go to competitions at different schools or events, such as Arnold Dancesport Classic and MIT Open Ballroom Dance Competition. Dancers can compete in four different categories. The categories are American Rhythm, International Latin, American Smooth, and International Standard. Competitors dance at different level based on their abilities. The levels of dance, in order of difficultly, are newcomer, bronze, silver, gold, novice, pre-championship, and championship. Bronze through gold is considered syllabus. Novice through Championship is considered open. Individuals and teams as a whole compete against each other. Victor Fung and Anna Mikhed dancing a tango in 2006. The couple, dancing for the USA, came third in the Professional World Championship 2009. "Ballroom dance" refers most often to the ten dances of International Ballroom (or Standard) and International Latin, though the term is also often used interchangeably with the five International Ballroom dances. Sequence dancing, which is danced predominantly in the United Kingdom, and its development New Vogue in Australia and New Zealand, are also sometimes included as a type of Ballroom dancing. In the United States and Canada, the American Style (American Smooth and American Rhythm) also exists. The dance technique used for both International and American styles is similar, but International Ballroom allows only closed dance positions, whereas American Smooth allows closed, open and separated dance movements. In addition, different sets of dance figures are usually taught for the two styles. International Latin and American Rhythm have different styling, and have different dance figures in their respective syllabi. Other dances sometimes placed under the umbrella "ballroom dance" include Nightclub Dances such as Lindy Hop, West Coast Swing, Nightclub Two Step, Hustle, Salsa, and Merengue. The categorization of dances as "ballroom dances" has always been fluid, with new dances or folk dances being added to or removed from the ballroom repertoire from time to time, so no list of subcategories or dances is any more than a description of current practices. There are other dances historically accepted as ballroom dances, and are revived via the Vintage dance movement. In Europe, Latin Swing dances include Argentine Tango, Mambo, Lindy Hop, Swing Boogie (sometimes also known as Nostalgic Boogie), and Disco Fox. One example of this is the subcategory of Cajun dances that originated in Acadiana, with branches reaching both coasts of the United States. Ballroom/Smooth dances are normally danced to Western music (often from the mid-twentieth century), and couples dance counter-clockwise around a rectangular floor following the line of dance. In competitions, competitors are costumed as would be appropriate for a white tie affair, with full gowns for the ladies and bow tie and tail coats for the men; though in American Smooth it is now conventional for the men to abandon the tailsuit in favor of shorter tuxedos, vests, and other creative outfits. Latin/Rhythm dances are commonly danced to contemporary Latin American music and (in case of Jive) Western music. With the exception of a few traveling dances like Samba and Paso Doble, couples do not follow the line of dance but perform their routines more or less in one spot. In competitions, the women are often dressed in short-skirted latin outfits while the men are outfitted in tight-fitting shirts and pants, the goal being to emphasize the dancers' leg action and body movements. According to World Dance Council. Viennese Waltz: 60 bars per minute, 3/4 time. On the European continent, the Viennese waltz is known simply as waltz, while the waltz is recognized as English waltz or Slow Waltz. 1 2 Franks A.H. 1963. Social dance: a short history. Routledge & Kegan Paul, London. ↑ Silvester, Victor 1980. Old Time and sequence dancing. Barrie and Jenkins, London. ↑ "History of Musical Film, by John Kenrick". Musicals101.com. 1996. Archived from the original on 11 May 2008. Retrieved 2008-05-29. ↑ "Review of "Swing Time" (1936)". rogerebert.com. 1998-02-15. Retrieved 2008-05-29. ↑ Complete listings of affiliations are given in the programmes of the major competitions. ↑ "Ballroom 101". USA Dance, Inc. Retrieved 9 April 2014. ↑ "History of Modern Ballroom Dancing". Archived from the original on 26 February 2007. Retrieved 2007-02-20. .
↑ "Archived copy" (PDF). Archived from the original (PDF) on September 10, 2015. Retrieved October 26, 2015. Abra, Allison. "Going to the palais: a social and cultural history of dancing and dance halls in Britain, 1918–1960." Contemporary British History (Sep 2016) 30#3 pp 432-433. Wikimedia Commons has media related to Ballroom dance.